Sorrento is one of the most impressive wedding destinations in Italy and, for wedding ceremonies, it offers breathtaking settings.In detail, three different venues are available for the couples who are looking for a civil wedding ceremony (read more about Getting married in Italy: which ceremony is right for you? ): the St Francis Cloisters, the Museo Correale and Villa Fondi (in Piano di Sorrento, 10 minutes from Sorrento). The Cloisters of St Francis, together with the Church and Monastery, is part of a historical complex dating back to the XIII century. It has a rectangular shape and its columns and arches create beautiful mullioned windows and fanlights. The combination of this peculiar architecture and the location in the historical centre of Sorrento, only at a stone throw from the sea, has made the Cloisters one of the most popular and sought-after venue to get married in Sorrento. Words cannot make describe the emotions of a wedding ceremony held in such a distinctive place where the uniqueness of the venue perfectly blends with the beauty of the nature. The Cloisters of St Francis is recommended for weddings up to 60 guests. The fee for the use of Cloisters of St Francis for civil or symbolic weddings varies on the day of the week (from Monday to Saturday) and time of the ceremony. On 2015, the fees vary between €450 and €800 (for weddings of non residents in Sorrento). For additional photos of the Cloisters of St Francis follow us on Pinterest. The Museo Correale is located in a XVII century villa, boasting precious period furniture, impressive paintings and china collection. The richness and splendour of this venue recalls the glorious past of the villa: a unique setting for your wedding in Sorrento. Do you prefer to get married outdoor? No problem, the Museo Correale is surrounded by a luscious and wide park with centuries old trees, plants and a citrus grove. This is the ideal location for the couples who dream to get married under the shades of the trees and, afterwards, enjoy the breathtaking views of the bay of Sorrento. The indoor hall and gardens of Museo Correale can host ceremonies with 100 guests. 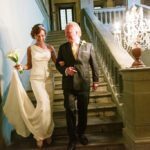 The fee for the use of the Museo Correale for civil or symbolic weddings varies on the day of the week (from Monday to Saturday) and time of the ceremony. The fees vary between €450 and €800 (for weddings of non residents in Sorrento). For additional photos of the Museo Correale follow us on Pinterest. Villa Fondi is a spectacular XVII century villa located only 10 minutes from the centre of Sorrento. It is located on the top of a cliff enjoying an amazing view of the sea, the Gulf of Naples and Mount Vesuvius. A remarkable area of Villa Fondi is the beautiful botanical garden, characterised by the presence of high olive trees and palms, which remind the famous gardens of Villa Rufolo and Villa Cimbrone in Ravello. The wedding ceremonies at Villa Fondi are set in the garden, on the panoramic terrace or indoor hall. Afterwards, the guests can sip a drink in the beautiful park while enjoining the stunning views of the sea and colourful boats of the small port just underneath Villa Fondi. The indoor hall and gardens of Villa Fondi can host ceremonies with approximately 100 guests. The fee for the use of Clositer of St Francis for civil or symbolic weddings varies on the day of the week (from Monday to Sunday) and time of the ceremony. 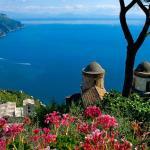 The fees vary between €500 and €700 (for weddings of non residents in Piano di Sorrento). For additional photos of Villa Fondi follow us on Pinterest. Keep in mind the Cloisters of St. Francis, the Museo Correale and Villa Fondi are located in proximity of some of the most beautiful reception venues in Sorrento. For those who are dreaming of a special setting for your wedding in Italy, Sorrento will offer a unique scenario: the blue of the sea, the lush hills, the colourful village with its picturesque streets, the liveliness of the Neapolitan music (typically guitar and mandolin), the mouth watering local cuisine and a wide range of wedding venues (from luxury hotels to folkloristic restaurants). You will be just overwhelmed by the choice but, do not worry, Bellissimo Wedding will be guide you in the choice of the ceremony and reception venues that will better meet your wishes and offer a continuous support in the planning and realisation of YOUR weddding.